Safeguarding is so important that it is something of which everyone in the church should have an understanding. We now have training that is accessible on line and we would encourage everyone to take the opportunity to find out more about safeguarding. We insist on face to face training for those who hold a licence, have permission to officiate, are parish safeguarding officers or have a position of responsibility in a church. However, on line training is a really useful way of allowing many more people to easily increase their knowledge. Face to face safeguarding training is taking place across the diocese, as set out in the schedule below. There is a maximum of 25 delegates per course, and a minimum of 10. Courses which do not meet the minimum numbers will be cancelled 7 days beforehand and delegates will be informed if this happens. Please let the office know if you have any special requirements. Due to budget constraints we are unable to provide lunch during training sessions; you are most welcome to bring a packed lunch with you. Hot and cold drinks will​ be provided. Note: it will not be possible to send out reminders of bookings. Delegates are asked to check the diocesan website for details of the venues. WHAT TRAINING DO I REQUIRE ? C0 – Basic Awareness. This is recommended for anyone who needs a basic level of safeguarding awareness. C1 – Foundation. This is required for anyone who has safeguarding responsibilities or who has contact with children, young people or adults who may be vulnerable. 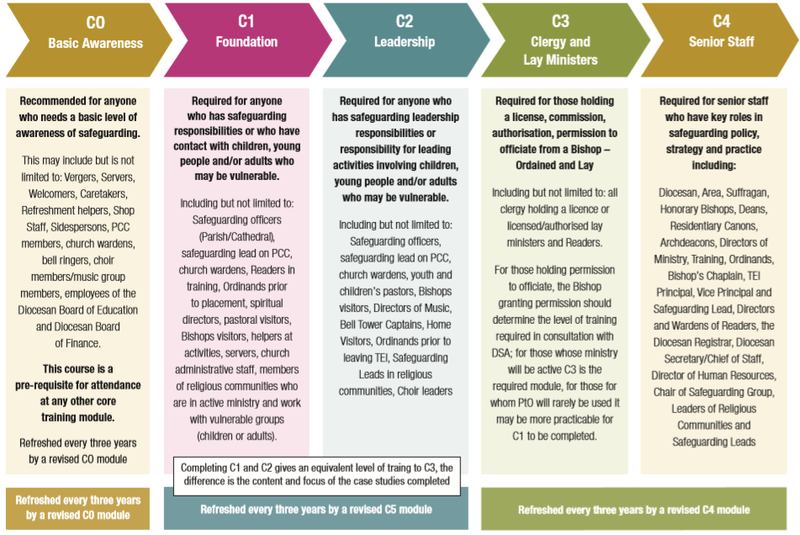 Both C0 and C1 safeguarding training modules are available for completion on line. In order to access the courses, please click here and then click the ‘On line courses’ button. If you have not previously done so, you will need to register for a user account by following the instructions on screen. Once you have entered your details you will receive an email with a link to activate your account. You should click this link to enable you to access the training. Going back to the training page, please click on the blue ‘Safeguarding Basic Awareness’ button beneath the picture located on the right of the screen. At the end of the course you will be able to print a certificate and receive an email confirming completion of the course. Aims: situate safeguarding in the context of the church and equip participants with knowledge of state and C of E legislation, policies and practice guidance. Who for: phase 1: pre-ordination/licensing; Parish safeguarding officers; Churchwardens; Leaders of children’s and adult activities; Safeguarding leads on PCC; Helpers at children’s and adults activities; Spiritual directors, Bishops Visitors; Non active PTO. Aims: equip incumbents, licensed and authorised ministers to embed healthy parish safeguarding practice. Who for: required for those holding a licence, commission, authorisation, permission to officiate from a bishop - ordained or lay. Including but not limited to: all clergy holding a licence or licensed/authorised lay ministers and Readers. Aims: The learning aims of the refresher course is to refresh and deepen personal knowledge and practice of safeguarding; equip participants to understand and implement changes and developments in national/House of Bishops'/Diocesan safeguarding policies and practice guidance. Who for: required for those who have completed a C3 course since January 2016 and hold a licence, commission, authorisation, permission to officiate from a bishop - ordained or lay. Including but not limited to: all clergy holding a licence or licensed/authorised lay ministers and Readers. Please note that C5 refresher training in 2019 will prioritise those listed above. You do not have to repeat the full C3 course if you have completed C3 since January 2016.